I’m really happy to introduce you to Kayleigh, our new contributor. She will be helping write new exciting content for May-Contain to raise awareness. I recently spoke to Kayleigh about how she found out about her peanut allergy, and how she came across the May Contain blog. Hopefully this gives you bit of insight into allergies and gives you the opportunity to get to know Kayleigh. How did you come across May Contain blog? It was a while back, I was reading the news stories about Natasha who died after eating a baguette from Pret that contained sesame seeds - an allergen that wasn’t listed on the product’s label. The story really had an effect on me as it’s something I worry about on a daily basis. I then started looking around for some way that I could help, whether it was fundraising or just raising awareness of the issue. I looked through a couple of blogs, then ended up on Instagram and stumbled across some old posts from May Contain. I just thought the concept was really interesting. The images that show young women putting epipens into their clutch bag for a night out really stood out to me because I’d never seen anything like that before - you usually only ever see pictures of epipens in a medical context which doesn’t help the stigma around it. I then visited the May Contain blog and read a few of the stories that really resonated with me and my lifestyle so I just felt like I should get in touch and see if there was a way that I could help contribute. The stigma around allergies and epipens means that a lot of young people don’t talk about it or carry things that could potentially save their life - that’s something that needs to change. I think its amazing that you want to raise awareness and take the stigma away from the Epi-Pen. How long have you lived with a severe nut allergy, does this stop you doing what you want to do? I was diagnosed with a severe peanut allergy when I was 18 months old after having an anaphylactic reaction. So I’ve basically lived my entire life with it. I have to admit it’s been hard in parts. As a kid, I wasn’t too bothered by it as my Mum took care of everything. She did an absolutely fantastic job making sure that she told my school about it, and being really clear when we went out for meals or to friends’ houses that I could not have anything with nuts in, or even have nuts near the kitchen. It can’t have been easy for her and I imagine it made her very anxious. There were a few occasions where I was bullied for my allergy, I distinctly remember someone holding a Snickers bar close to me once. Fortunately, this stuff didn’t really get to me, but there could definitely be something done to make kids more aware of how serious that could have been if it had gone wrong. When I started getting older, I had much more of a responsibility to look after myself as I was going out on my own more with friends. My close group of friends were well aware of how to use the Epipen should they need to, but they did often make jokes about it (they still do!). I think having a severe allergy does stop you doing certain things, or at least limits your freedom slightly as you have to always think about where you’re going to eat. For example, I love travelling, but there are definitely some places that I think are off-limits to me - Thailand, Bali etc. This is even apparent at home in England where I won’t eat out at restaurants serving Chinese, Thai, or Indian food because the risk of contamination is just too much. It’s just a factor that I have to consider every day. Sometimes it can be daunting, but I just work around it as best as I can. Have you ever had a severe allergic reaction and had to administer the Epi-Pen? Not since the reaction I had as a baby, thankfully. I’ve had a couple of situations where I thought I was reacting, but nothing serious ever came from them. I actually got re-tested this year in February to check that I was still allergic (unfortunately, I still am). A lot people risk eating food that says may contain, do you you take risks? This is a hard one. I’ve definitely eaten foods that say ‘may contain’ before, but as a rule I stay away from them. Unfortunately, manufacturers don’t make this easy on people with an allergy because I have seen a lot of ridiculous stuff (milk?!) claim that it ‘may contain nuts’ when it’s clearly just a statement to cover themselves. I have done shops in certain supermarkets where everything I pick up has a warning on. That can be really frustrating and disheartening, but I’ve learnt along the way that there are some great places and brands that offer safe food, so I just stick with what I know. In terms of this warning in restaurants, I just use my judgement, and I speak to management to make sure they know and can take precautions. It’s one of those things that you could go for years eating food with ‘may contain’ warnings and have no issues, but the one time that there is actually cross contamination, that could take your life, and I think that’s something you should think about quite seriously. I hope you enjoyed the post. 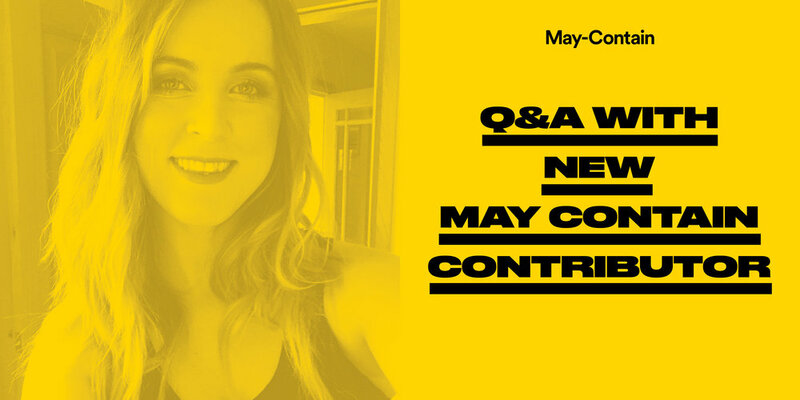 If you're reading this and interested in writing for May Contain, please get in touch. I’m always on the lookout for writers to help me raise awareness about allergies, and write exciting content that will engage a wider audience.